« I think they left something out. . . .
Good morning to all readers, brothers and sisters, comrades, and all the ships at sea. The work week has begun again: it’s Monday, June 25, 2018: National Strawberry Parfait Day. It’s also National Catfish Day in the U.S.
As for what happened on June 25, a photograph was taken on this day in 1848, during the June Days uprising, that’s said to be the first instance of photojournalism. The explanation is in the caption. The June Days uprising was an uprising staged by the workers of France from 23 June to 26 June 1848. It was in response to plans to close the National Workshops, created by the Second Republic in order to provide work and a source of income for the unemployed, albeit with pay just enough to survive. The National Guard, led by General Louis Eugène Cavaignac, was called out to quell the protests. Things did not go peacefully and over 10,000 people were either killed or injured, while 4,000 insurgents were deported to Algeria. On this day in 1876, the Battle of the Little Bighorn (“Custer’s Last Stand”) took place in Montana Territory, with four tribes of Native Americans slaughtering nearly 300 members of the U.S. Cavalry. On June 25, 1910, the U.S. Congress passed the Mann Act, prohibiting transport of women between states “for immoral purposes”. It would be used to prosecute many whom the government didn’t like, including the black boxer Jack Johnson. On that same day, Stravinsky’s ballet “The Firebird” opened in Paris, creating his reputation as a composer. 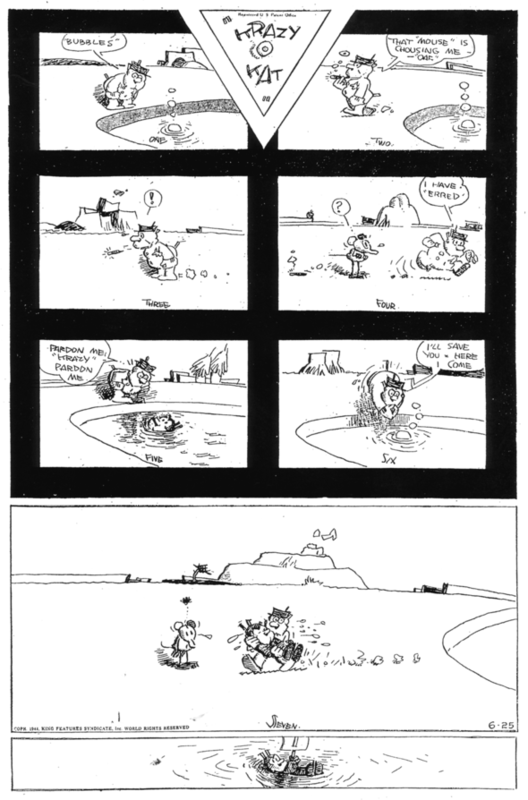 On this day in 1944, the very last strip of the wonderful comic Krazy Kat was published, exactly two months after its author George Herriman died. Matthew and I are both huge fans of Krazy Kat, and here is the last strip. Officer Pupp saves Krazy while Ignatz the Mouse looks on, but then Krazy finds a way to navigate the water. On June 25, 1947, Anne Frank’s Diary, called The Diary of a Young Girl, was published. Exactly one year later, the Berlin Airlift began as a way to obviate the Soviet blockade of Berlin. On this day in 1950, the Korean War began as the North invaded the South. On June 15, 1975, Indira Gandhi declared “The Emergency” in India. On this day in 1984, Prince released his famous album “Purple Rain”. Finally, or so Wikipedia says, this day in 1987 was ” the last date until June 17th 2345 when the digits in dd/mm/yyyy format are all different.” That would be 25061987. Notables born on June 25 include Antoni Gaudí, one of the most creative architects of our time (1852; killed by a tram), Louis Mountbatten (1900), George Orwell (1903), June Lockhart (1925), Bert Hölldobler (1936), Carly Simon (1945), Sonia Sotomayor (1954), and Ricky Gervais (1961). Those who expired on this day include Mary Tudor, Queen of France (1533), George Armstrong Custer (1876; see above), painter Thomas Eakins (1916), Michel Foucault (1984), Jacques Cousteau (1997), and Farrah Fawcett and Michael Jackson (both 2009). A: What is the first principle of safety? Ja: Jaka jest pierwsza zasada bezpieczeństwa? This is not so much a conversation as a surrealist art installation. Yes, this was a real book. “Loving correction” indeed! This is in Cork, where Grania lives. How did this tropical mammal get there? Old elephant proverb of the day. This is a Jesus donkey. (I don’t know the proper breed name, or if all donkeys have crosses.) According to Christians, they didn’t have a cross on their backs before Jesus rode one into Jerusalem for the beginning of the events that would end in his crucifixion. Cute though. This entry was written by whyevolutionistrue and posted on June 25, 2018 at 7:00 am and filed under Hili Dialogue. Bookmark the permalink. Follow any comments here with the RSS feed for this post. Both comments and trackbacks are currently closed. Anyone want to bet that different format will be in use on that date? ^^^^^that is a punchline- because nobody here will … never mind. I realised I don’t have a garden, so I gave up. Sorry to be such a pendant, but I know PCC hates typos. Today is the 25th and you’ve misspelled Prince. Goin’ all Walter Winchell with that salutation, huh, boss? Though an old Red-baiter like Winchell wouldn’t’ve used “comrades,” except with a sneer. Tony Hancock (and his sidekick the fast-talking ‘fixer’ Sid James) were the first TV comedians I recall watching, on Hancock’s Half Hour. A Walter Mitty-like character, dozens of comedians since have followed in his footsteps. Korean Conflict, no declared war. The forgotten conflict by most even in the history ignorant U.S. Another country divided by war that caused great problems. A conflict that could have been over in less than a year if not for one arrogant general turning it into a nearly 4 year mess. Re: the mini-tornado. Here in the American Southwest, we call those dust devils. They happen all the time. Re: the raccoon. Whoever is dumb enough to put a bird feeder on that skinny little post might just as well put the seed on the ground. After a similar experience with those posts, I went to 4×4 treated, and put the baffles up with lag bolts. Re: Christians beating their kids. Nobody does it better than Debi Pearl, who advocates beating your kids with a rubber hose when they cry, to “break their will”, starting at AGE FOUR MONTHS, when they have somehow, miraculously, from one day to the next, developed the ability to form intent. Gross. Until pretty recently every kid on the face of the earth was beaten on a daily basis. My mum grew up in Czechoslovakia, and my grandad(who she loved more than anything) beat her and my aunt with his belt regularly. Often my aunt would get chased around the garden for doing something naughty, and if my grandad couldn’t catch her he’d grab my mum and beat her instead. Those dust devils or mini-tornadoes can occur anywhere in the world, and they persist for a surprising length of time. Actually we used many of those rod hangars as bird feeders for several years. The raccoons did not seem to bother them much. If they do go after some of the items you can always bring them in at night. Dumb old me. You’re lucky, or else your raccoons had another food source. I put those rod hangers out one day, and the following morning, they were toast. I’ve had enough experience with raccoon ingenuity to know better. “The ability to form intent” aka free will. LOL @ the psittacines with the cups! I once had an appendix QH mare with a dorsal stripe. How odd was that? Yes, conservative Christians have been obsessed with corporal punishment ever since Benjamin Spock allegedly promoted excessive parental permissiveness. “Spare the rod…” is their favorite line in Proverbs. It is understandable that Otto Frank initially published a bowdlerized edition of Anne Frank’s diary, but the “study edition” assigned in my 8th grade further omitted her discussing her first period (in addition to having utterly inane study questions at the end of each chapter!). This was my first year in a predominantly public school district, and a large portion of my 8th grade classmates had already read it, and caught the omission!! It would be very very difficult for me to decide what was the 2nd best Beatles album. Mickey Mouse, Jesus and Lenin. How do we know the man on the right (left from his pov) is Jesus? we know what Lenin and Mickey look like, but the looks of an imaginary Jesus are speculative at best. True enough, I was taking the caption at face value. Which might simply stem from “creator intent”, after all. That couldn’t be Jesus. I don’t think he could have had a book like that. 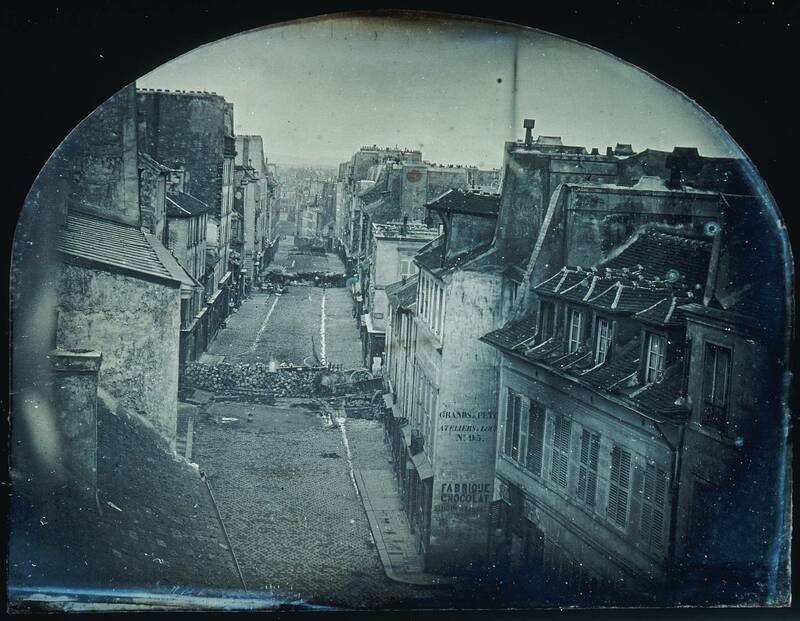 2) A primary reason for Napoleon III’s massive renovation of Paris with broad avenues was to thwart the barricade-happy Parisians.